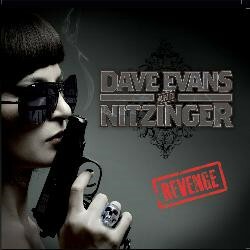 Original AC/DC singer Dave Evans has teamed up with guitarist John Nitzinger to release ‘Revenge’ on April 25th through Bad Reputation Records. This unique collaboration between two legends of Australian hard rock and Texas rock/blues has produced a blend of powerful riffs, chords, lyrics, melodies and vocals which capture and ignite the excitement and emotion of each song. This diverse album has been described as “AC/DC meets Alice Cooper deep in the Heart of Texas and so much more”. Dave and John were introduced by a mutual friend in Fort Worth, Texas while Dave was on tour and the two became instant friends. After listening to, and appreciating each other’s music and styles, John asked if Dave would like to record an album with him of songs that he had written. Dave felt honored and readily agreed to this exciting and challenging project and now here it is — one truly epic rock album like no other the world has ever seen, heard or felt. Dave Evans began his recording career with AC/DC as one of the five founding members and sang on the very first recordings including the hit single “Can I Sit Next To You Girl” which was named as Australian single of the year. He performed at every major venue in Australia with AC/DC, including the famous Sydney Opera House before splitting with the band. Dave continued on with the same hard driving rock sound that is Aussie rock with Rabbit which produced two albums, with the ‘Too Much Rock N Roll’ album being released throughout Europe and Japan. After Rabbit Evans released the ‘Dave Evans and Thunder Down Under’ album which boasted the cream of Australia’s musicians before beginning his solo career releasing two acclaimed albums, ‘Sinner’ and ‘Judement Day’. “Sold My Soul To Rock N Roll” from the ‘Sinner’ album was nominated as best rock song at the 2007 Los Angeles Music Awards. Dave has toured across Europe to rave reviews and has recently made Dallas, Texas his home base. John Nitzinger, a Texas legend and worldwide force behind rock & roll since the ’70s contributed to the signature sound of ‘Texas Rock and Blues’. Nitzinger was one of the first inducted into Buddy Magazine’s Texas Tornado’s Hall of Fame in 1978, “as a Texas Tornado of Guitar, one of the best musicians in Texas, perhaps in the world.” Writing with Bloodrock he was awarded a gold album from Capitol Records for ‘Bloodrock 2’. He signed to Capitol as solo artist to release ‘Nitzinger’ and ‘One Foot In History’ with the classic “Louisiana Cockfight”. In 1976 he signed with 20th Century Fox to produce ‘Live Better Electrically’ — this album reached the charts with two hit singles, “Are You With Me” and “Yellow Dog”. In 1980, as major songwriter and guitarist, he joined Carl Palmer to release ‘1:PM’, the album’s single “Dynamite” increased Nitzinger’s popularity overseas. In 1982, John joined Alice Cooper on his ‘Special Forces’ international and USA tours as guitarist. John also wrote with Cooper on ‘Zipper Catches Skin’, released on Warner Bros.